Pay No Attention To The Un-Cool Guy Behind The Curtain! You never stop being a teen-ager, do you. Not really. I started rehearsals last night for a show coming up that’s a series of story-telling/monologues. Basically a StorySlam, or like The Moth. There’s several theater people, a couple people who’ve just had interesting lives, and a really good area hip-hop artist. The hip-hop artist is one of those people with intense magnetism – he has a big laugh, he speaks with big gestures, and in a melodic flow of words that are imagistic as much as literal. In other words, he’s very cool. Now, I like to think I am not a total stranger to coolness. I’m no Arthur Fonzarelli (Exhibit A: I use Fonzie as a benchmark of cool), but I’d like to think I wouldn’t be the first person cut on Survivor: Cool Edition. I persevered. I explained how the serious story leads to the light-hearted one, dramatically speaking. My energy built as I said I wasn’t trying to Frankenstein her biography together, but it made for a nice transition from forced order as an MD, to organic chaos, trying to run the light board at a big country music concert (and it all going wrong – including the singer being in darkness, but floodlights blasting the people in the front rows). I hate to admit it, but that’s pretty much the same feeling i get whenever you like one of my posts. On the other hand, Fonzie isn’t cool enough to make me watch Happy Days. Me Too! You must be the coolest of cools to have us all groveling at your keyboard. 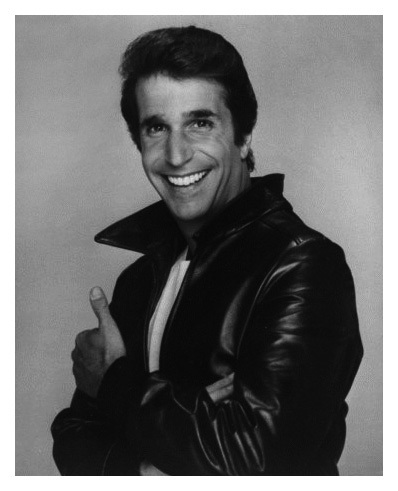 It’s good to have a role model, but aiming so high as The Fonz? You’re just setting yourself up for disappointment. I mean, you’re great and all, but no one (and I mean no one) has the trifecta of hair, leather jacket cool factor and thumbs-up nuance that he’s got. I bought an old juke box to practice making start by hitting it with my elbow. I do that, too. I think I am even worse with social media. Umm, I seem to recall tales of bras flying off as the result of mere side hugs from The Byronic Man. P.S. – I found this post very hard to relate to. P.P.S. – Ha ha ha ha ha ha ha. Sigh. Okay, my side hugs do have a certain degree of “Aaayyyy!” to them, I’ll admit. I just read an interesting article about Happy Days, and Gary Marshall – the creator – in particular. His goal was to make an honest, kind of dark show about growing up in the 50’s… and no one watched. So he made the conscious decision to give up all of that and just make what he thought would be popular. Still turned out pretty great. I always thought grown up Opie was the cool one (that’s how cool *I* am). At least you didn’t go with Potsie. All the cool kids think YOU’RE the cool one, B-Man. Also? My mom thinks so. You seriously should have gone with the camel. I would have, but decided I wanted to keep the idea for myself. Go easy. Don’t jump the shark. But I just put a down-payment on a giant tank! I wonder what it feels like to be “cool”. I thought I knew; turned out I was just thirsty. I think any story could be improved by the addition of a talking camel. It’s the obvious thing missing from Citizen Kane. You’d hope so, wouldn’t you? I haven’t a clue what you are talking about. Really. There are cool kids? Of course! With their Izods and Camaros and pooka-shell necklaces… doesn’t matter if they’re CPA’s, that’s how they dress. It’s that fine line between “cool” and “hipster” I think. I bet Bruce Springsteen knows he’s cool… and he just is. It would have been even cooler if the talking camel was blue or some other outrageous colour. Gotta build up the levels of coolness, B-Man. Take it from a pro. Camel = blue. Got it. It’s the only way I’ll learn! Looking at the Fonz…lives above someone’s garage, is revered by local high school geeks who are considerably younger than him, has nearly no prospects for doing much of anything with his life, can take a bra off a radiator with little if any effort. Was he really that cool? You know who actually is supposed to be ridiculously cool? Henry Winkler. By all accounts he’s just the best person you’d ever meet. Is he back on Arrested Development? I hope so. Definitely. That definitely happened. I hope. So you’re “not the dreamer…you’re the dreamee.” Whoa. That’s cool. Aren’t you too tall to impersonate Mr. F? I hate to ask, but, was the fist pump enough to bring the others around to your point of view? I think they were there already, but it definitely put an exclamation mark on it. Survivor: Cool edition would be amazing! That’s how I feel when you comment on my blog. So you’re doing a show?! What in the hell? You really should get out more, your life is so boring. Admit it. You are really the super cool hip hop dude. agree with Maineiac – you are one of the cool kids!